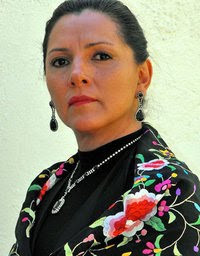 In honor of Women's Month and the Bicentennial of the Mexican War of Independence from Spain, Carlos Theatre Productions is proud to bring the celebrated Mexican actress, Zaide Silvia Gutierrez, who is probably best know for her role as Rosa in the film, "El Norte", by Gregory Nava, which was nominated for an Oscar in 1993. This dramatized reading, which will be presented in Spanish, is based on the life of Josefa Ortiz de Dominguez, who played a pivotal role by warning Father Miguel Hidalgo that the Spaniards had learned of the independence conspiracy. Father Hidalgo then gave the Cry of Freedom, celebrated to this day as, "El Grito de Independencia", and the war began in 1810. SENORA INDEPENDENCIA is authored by Gilda Salinas. Co-directors are: Maria Muro from Mexico, and Patricia Carlos from Chicago. Local actors include: Lauro Lopez, Roma Diaz, and Alfonso Seiva. Scenography by Esperanza Gama. Carlos Theatre Productions, under the direction of Patricia Carlos, has brought theater from Mexico for many years featuring the finest actors from Mexico.